All normal Player attacks take -5 BTH and deal *85/80 damage. The level of the bleeding is 135, dealing 19-118 damage every turn, until the monster succeeds on a save identical to the one above. ***Your mace's razor-sharp flanges open a deep bleeding wound! ***This creature has no blood! ***Your foe's wound was not deep enough to begin bleeding. 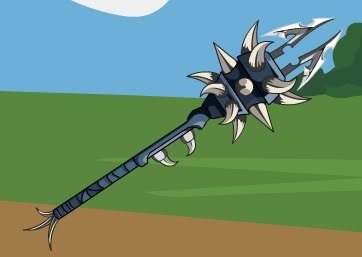 The vicious and powerful mace wielded by Nemesis is designed to lacerate flesh from bone! The more you hit your foe, the better your chances of causing your enemy to Bleed! Image thanks to BlackAces. Numbers thanks to In Media Res. A standard special attack (1396% Base and Random, 991% Lucky Strikes, +51 BTH). It takes -5 BTH and deals *(85/80) damage. Since it's 4 hits, each hit deals 25% damage.